While playing Bethesda RPG’s most people know you should be saving often. You never know what will confront you around the next turn or anytime you enter a building or new area. Everyone knows this. Right? Unfortunately, too many times I’ve found myself becoming complacent while playing Fallout 4. I’m currently working on my Xbox One playthrough (I’ve started on PC, but would prefer to finish it on Xbox first) and I learned a lesson the hard way today. I was exploring the satellite array, as part of the ‘Lost Patrol’ questline and I struggled several times to clear the area. There are quite a few difficult enemies in the area, and I kept getting overwhelmed. I didn’t have any artillery in range, so I called in a vertibird hoping to use the minigun to my advantage. Unfortunately, I got myself killed again and again, usually by an exploding vertibird as I tried to take down some of the brutes. Eventually I got the area clear and took down the legendary super mutant with the help of all three of my mini nukes and several missiles. I was working on checking out the area and gathering up all of the useful loot when I eyed a set of steep stairs that seemed to be hiding something good! As I approached the stairs I thought to myself maybe I should save, but figured I’d wait until I got to the top. Well it turns out I’m quite terrible at walking up narrow stairs, as I plunged to my agonizing death seconds later. What a terrible feeling! The worst part was that my most recent save was before I took on the legendary mutant, and I failed three more times before I finally downed him again. As I approached the deadly stairs again I made sure to save before I took the above screenshot, and then I carefully crawled up the stairs to see what awaited above. Would it be worth the horrific death? As it turns out, what lied above wasn’t really worth it. There was some ammo and some power armor, but I never even use power armor. I find it too much of a hassle to track it down and equip it, even though wearing a suit probably would have made clearing out the satellite arrays much easier. I learned a hard lesson today, and with that I sort of lost the desire to play more Fallout today. Dying over and over again got a little frustrating, so I’m putting Fallout aside in favor of some more Rocket League, a game that’s much easier on my blood pressure! 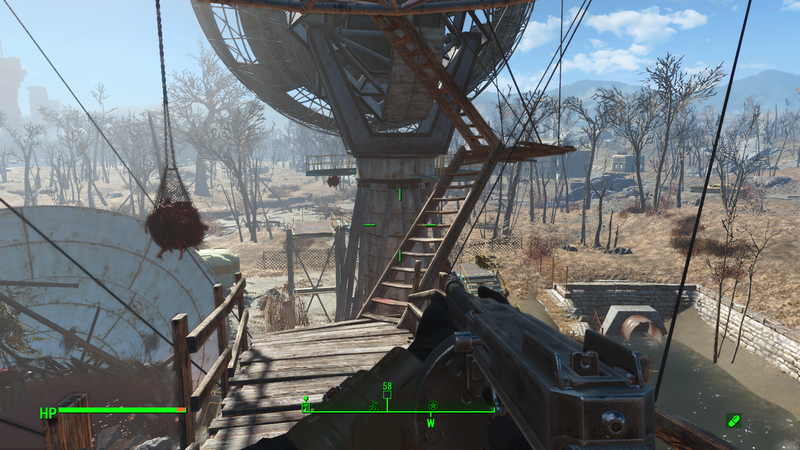 This entry was posted in Video Games and tagged Fallout 4, Fallout 4 satellite array, fallout 4 satellite array stairs, Fallout 4 save often, video games, Xbox, Xbox One. Bookmark the permalink.